Pre-meetings background - winds of change: Will Bank & Fund's 'new' approaches help 'the poorest'? What is left of the rise of the South? October 17 marked the 25th anniversary of the International Day for the Eradication of Poverty. According to the Sustainable Development Goals (SDGs) website, examples of impressive recent achievements in combating extreme poverty include a decrease in the global poverty rate from 28 per cent in 1999 to 11 per cent in 2013. The standard narrative, echoed by former US President Barack Obama during his speech at the UN in September 2016, is that the neoliberal policies of ‘globalisation’ and ‘open markets’ have been the driving force behind the significant drop in poverty rates (see Observer Spring 2016). As argued by Babb and Kentikelenis in their 2017 paper, the World Bank and IMF in turn played a key role in developing and enforcing neoliberal policies associated with, inter alia, globalisation and open markets globally. While likely driven by a fear of an anti-globalisation backlash (see Dispatch annual meetings 2017) and perhaps sharing UNCTAD’s assessment that “anxiety is fast becoming a new zeitgeist of the twenty-first century global economy”, the Bank and Fund have recently been said to soften their stance on structural adjustments and neoliberalism generally (see Observer Summer 2016, Summer 2017). BWIs – taking credit where none is due? Despite these rhetorical reassessments, the Bank and Fund, like Obama, remain in no doubt that the policy prescriptions they energetically promulgated during the past 25 years can be credited with the success in global poverty reduction. 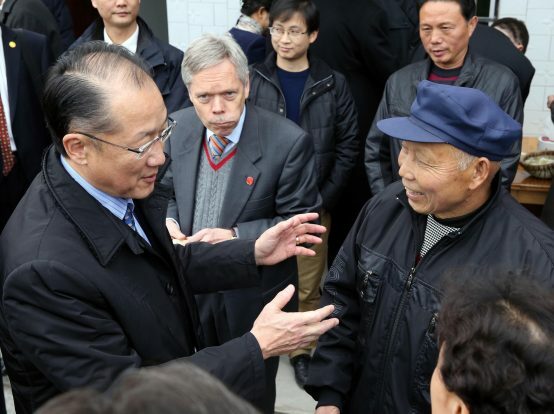 Speaking in Washington ahead of the World Bank and IMF’s annual meetings in October, World Bank president Jim Yong Kim called China’s efforts to eliminate poverty historic, noting, “With [its] embrace of the global market, China has lifted over 800 million out of poverty”. Kim is indeed correct in his assertion that Chinese efforts have been historic. An October report by the US-based think tank Center for Economic and Policy Research (CEPR) supports his point, noting that “for the 25 years [up to 2016]… two-thirds of the approximately 1.1 billion people who were pulled across the extreme poverty line were in China”, adding “from 1981 to 2010, it is even more a story of Chinese success: about 94 percent of the reduction of extreme poverty was in China.” However, Kim’s implicit assertion that Chinese growth is due to its embrace of global markets in line with Bank and Fund neoliberal prescriptions has been robustly challenged. CEPR’s report stressed that “Chinese global economic integration was not based on neoliberal reforms and policies that were adopted by the vast majority of low and medium-income countries since the 1980s”. It noted: “China did not establish an independent central bank or abandon the industrial and development policies of prior decades. … They maintained state control over the banking system, had strict currency controls and a huge role for state-owned enterprises, and until recently the state controlled most investment.” China’s departure from the neoliberal model is also stressed by Ha-Joon Chang. The fact that China’s growth has largely been achieved by policies that contravene the Bank and Fund’s received wisdom poses a significant challenge to the legitimacy of the models they have historically supported. Putting the issue into historical context, Chang has noted that “the popular impression, largely created by neoliberal propaganda, is that neoliberalism … is able to generate rapid growth, albeit often at the cost of worsening other ‘social problems’”. However, he stressed that “Per capita income growth in the developed countries slowed from 3.2% to 2.2% between the interventionist period 1960-80 and the neoliberal period of 1980-99, while that in the developing world halved from 3% to 1.5%”. Echoing Prates and Peruffo’s 2016 article What is left of the rising South, Chang stressed that “without … China and India, two countries that have definitely not followed the neoliberal recipe, the 1.5% rate would have been close to 1%”. UNCTAD’s 2017 Trade and Development Report must also have made uncomfortable reading for the Bank and Fund, as it noted that the international consensus during the high-growth, interventionist and so-called, golden age of capitalism, “required the leading economies (and their corporations) to accept some constraints on their ability to dominate international markets and to move capital freely from location to location” – clearly not the case under the neoliberal policies supported by the Bank and Fund. Noting that the rupture with the consensus was followed by hyperglobalisation in the 1980s, the report outlined its characteristics and consequences: “extensive deregulation of markets − particularly financial and currency markets … [and] the curtailment, and sometimes even the elimination, of policy measures previously used by States to manage their integration into the global economy.” As Chang and others have argued, the policy space available to China to manage its integration into the global economy has been pivotal to its success. This is however conspicuously absent from the Bank and Fund’s story. As the UNCTAD report noted, this freedom was to a large extent denied to adherents of the Bank and Fund’s neoliberal policies (see Observer Summer 2017, Summer 2016, Winter 2014). These reports and papers challenge the Bank and Fund’s claim that the adoption of neoliberal policies, while perhaps painful in the short term, is worthwhile in the long run. Given the well-documented negative impacts of the years of structural adjustment programmes forced upon countries during the slow growth period of hyperglobalisation (see Observer Winter 2015), the confirmation that the bulk of progress made in global poverty eradication can be attributed to policies that contravene Bank and Fund dogma is damning indeed.